Quality product and was packed extremely well. If you are looking for a piece of furniture in true gray color - this may not be for you. This gray has a greenish undertone - which suits my needs but may not work for you. 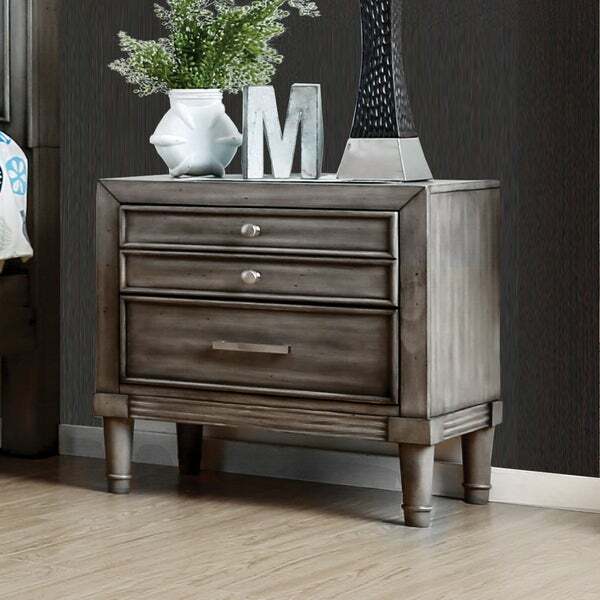 Feel the warmth and charm that radiate form this chic, contemporary style nightstand with sultry grey finish and silver-tone hardware. The turned legs and raised trim add an elegant touch for a sophisticated, yet fun piece with incredible charm! Dimensions 23.5 In. X 16.0 In. X 24.0 In. This nightstand is quality! Extremely happy with it, the perfect height and solidly made. Finish is beautiful and it was worth every penny! Love the hidden drawer and how it didn't even need to be assembled. 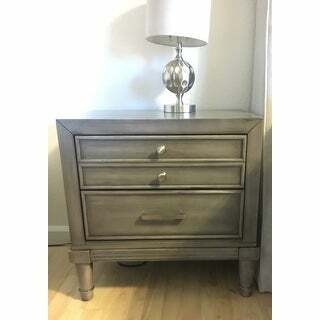 I was a little hesitant about ordering a piece I couldn't touch before buying, but this little chest is heavy, has lined drawers, and glides effortlessly. It was packed better than anything I've ever purchased. Super thrilled with it. 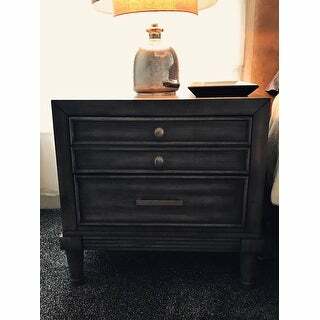 This dresser is beautiful. Very sturdy! The drawers are dovetailed. Nice hidden drawer inside. Worth the price! Ships in one piece, just need to put the legs on. I found a matching armour through a different company too! The nightstands came packaged very securely. It was incredibly easy to set them up as it only required to screw the legs in. The height of the nightstand is a little smaller than I am used to, but it is as expected based on the posted measurements. 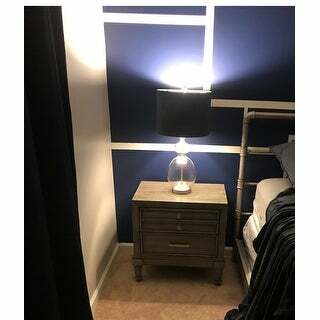 Overall, very sleek modern but yet rustic looking nightstands. Love the hidden top drawer! Easy to assemble! Love love love these nightstands. Especially the hidden drawers. They look so nice next to my bed. Highly recommend the whole set. Very chic and contemporary. 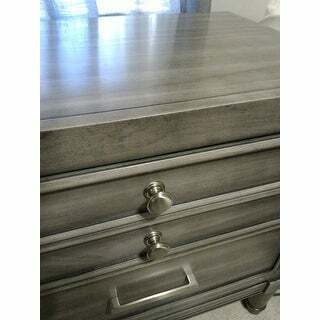 I bought this side table along with the dresser. It’s a good height whether you have a high or lower bed. I’ve never ordered furniture from a website but so happy I did. The colour is a nice change to ‘typical’ bedroom furniture, when I was shopping around mostly seen i.e white, wood,etc. I Came very well packaged. The only strange part was the instructions in the box were irrelevant to the table. The legs of the drawer just require to be screwed in, no tools required. Easy Setup, good quality, as pictured. This unit was packaged almost entirely put together except for the legs. Very sturdy packaging and item arrived in good order. Unit itself was exactly as pictured, large drawers, and I liked the hidden drawer for any items I would like to store more securely. Drawers are a little hard to open and close, they don't glide easily, but that may be something that resolves itself with more use or a little WD-40. This is one of the nicest pieces of furniture i have ever owned. The quality is nice and elegant. The drawers slide out smooth and go in smooth. It is truly a remarkable piece. I would definitely recommend owning this. This a great product. I found it here about *** cheaper than on ***. I love this product the hidden drawer is an added bonus feature. I did get one night stand with a bubble on the drawer so the fake wood would as some point probably chip off in that section. I will be reaching out to Overstock regarding that but the drawers came assembled I just threw on the legs and that was it. I love them especially since they are the height of the bed so I can actually use them. I recommend them ! 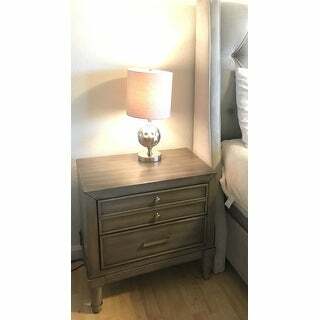 We love these nightstands, we put them in our bedroom they are perfect! They are also great quality & they are heavy, sturdy but not to heavy & they each have a 3rd secret but not obvious drawer in them, My husband & I Both Love then! Definitely a Great Buy! Looks smaller than the picture but it is good. At first I was little hesitant to order these nightstands but I am so glad I did!! It is the perfect addition to my son’s room and it compliments and match his bed so well!! Looks more expensive than what it really is and great quality ! Love it! I love the design and look of this dresser, however there were some minor flaws. I decided to overlook them since it would have been too much trouble to send the nightstands back and wait for replacements. They do look great in my bedroom! These night stands look really nice. They are a great size for storage. One of the nightstands is difficult to open the top drawer. It does not slide well. The other nightstand works perfectly well. That is the reason for the less stars on my review. I’m sure I could send it back but it’s too much hassle. Great night stand! A lil short, but over all great accent piece. Love the extra hidden draw, love the color, love the design and overall appeal. Just wish it was a little taller. "Is there a dresser that goes with the nightstand"
"Is this it made of wood?" Good price and hidden drawer. This would go great with my grey tufted bed. I also like the secret drawer inside. Love the grey look, it will match prefect with my bed. And the reviews made were worth buying. "Is the rest of the set available?" Unfortunately no, this is the only piece available. "this looks much wider than 2 ft, can you confirm the width please."